Keep cool and comfortable this season in this playful pair from Django & Juliette. The MELIZA sandal is set upon a low wedge sole for the perfect touch of height, along with a cushioned footbed for the utmost comfort when you're on your feet all day. 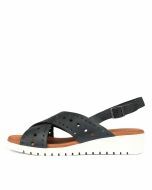 The soft leather straps feature polka-dot laser cut detailing to give your look a touch of character, whilst the slingback strap with an adjustable buckle ensures a secure fit.